This brochure, one of a series, introduces you to the concept of subdivision process and how it is used in Montgomery County, Maryland. The Montgomery County Planning Board of The Maryland-National Capital Park and Planning Commission invites residents to participate in the planning process, which includes the subdivision process. In this process, The Montgomery County Planning Board must determine whether a proposed subdivision satisfies the recommendations of the area Master Plan, requirements of the Zoning Ordinance, Subdivision Regulations, Annual Growth Policy, the Adequate Public Facilities Ordinance, and the Forest Conservation Regulations. Prior to Planning Board approval, the Montgomery County Department of Permitting Services must approve a stormwater management concept plan for the proposed development. The process begins when an applicant files either a Pre-Preliminary Subdivision Plan or a Preliminary Subdivision Plan for review and approval. after consideration by the Planning Board, the preliminary plan is the next step. 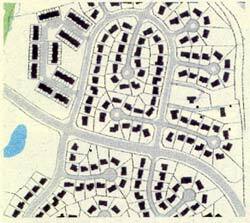 An applicant is required to send a written notice about the requested subdivision and a copy of the plan to adjacent and confronting property owners. The Development Review Division of the Department of Park and Planning sends a written notice and a copy of the proposed plan to appropriate citizens associations and homeowners associations that are listed with the Planning Board. In the case of a Cluster Subdivision, which allows more flexible development standards such as smaller lots, the applicant must additionally post a sign on the property. A resident, neighborhood, or citizens association can effectively participate in the subdivision process by becoming actively involved in each of the two phases. A staff member of the Development Review Division of the Department of Park and Planning is assigned to analyze, evaluate, and coordinate the review of the proposed Subdivision Plan. The staff member receives input from the Department's environmental and transportation staffs, and the Development Review Committee (DRC). The DRC is an interagency task force composed of representatives from public agencies and utilities such as WSSC, PEPCO, the State Highway Administration, and the County Departments of Permitting Services, Environmental Protecton, and Public Works and Transportation. The DRC meets in regularly scheduled sessions that are open to the public but are not public hearings. Montgomery County citizens testifying before the Board. Upon request, staff will meet with community representatives to discuss relevant issues. To schedulea meeting, please contact the Development Review Division at 301-495-4595. The assigned staff member prepares recommendations that are presented to the Planning Board as part of the public hearing on the proposed Subdivision Plan. Notice of the public hearing is mailed by staff of the Development Review Division to all persons and associations who received the original notice, as well as other parties who have expressed an interest. The Planning Board's public hearing includes the staff presentation, the Applicant's case, and testimony from affected property owners and citizens associations. No person involved in the subdivision process may discuss any issue about a proposed subdivision off the public record with a member of the Planning Board. You should contact your neighbors and your area citizens association. 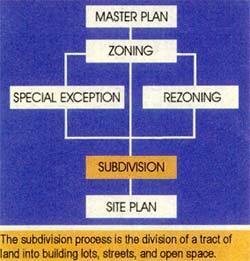 Discussion of mutual problems, concerns, and issues involved with a proposed subdivision is a basic first step. Informal community meetings are a good way to reach agreement, assign tasks, and coordinate a response to a subdivision proposal. Meeting with applicant is encouraged to discuss the proposed subdivision to provide basic information and to clarify issues. Call the Information Counter at 301-495-4610 to learn how the subdivison process works, the timing of staff evaluation, and the proposed date of the Planning Board's public hearing. For a more detailed discussion of issues related to the proposed subdivision, you can contact the staff member assigned to review the case at 301-495-4595, When calling, please refer to the applicaflon number. Normally, an applicant for subdivision approval will respond to staff's evaluation or issues raised by the Development Review Committee by submitting a revised subdivision plan. If the staff reviewer decides that the proposed revisions are significant, the applicant may be directed to send copies of the revised plan to the same adjacent and confronting property owners and citizen associations that received copies of the original plan. Making your views in writing known to the staff and Planning Board is a basic and essential way to effectively participate in the process. The written comments received from residents and associations will be distributed to the Planning Board prior to the public hearing. Effective citizen participation in the subdivision process requires a continuous effort that involves time and initative. For more detailed information about the subdivision process and the CounWs land use control procedures and requirements, download the book Everything you always wanted to know about ... Planning, Zoning and Subdivision in Montgomery Counly, Maryland(9 MB).